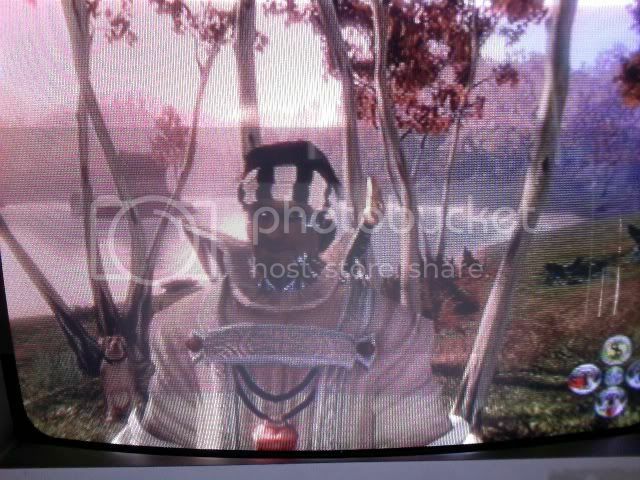 Discussion in 'Fable II' started by ScareCrowReturn, Nov 20, 2008. Post Pictures of Your Character here! Or if you don't have a Camera.. Explain in Detail what they look like! noice, my guy right now has gold dreadlocks and white and gold and black clothing. how much do 360 webcams cost? i need one so i can post some pics up here. hes 100% good/pure, so he has blue eyes, blond hair (ponytail, the chops, the handlebar), he wears all Noble gent's stuff, and the coat/hat are dyed swarthy revenge indigo dye (5 star dye its, well indigo),the coat is opened instead of closed, the shirt is colored black and white (white top part, black bottom part, black noble gents pants, noble gents shoes, he has very, very, VERY faint will lines, cuz i never wanted him to have will lines but my brother was being gai so he put as much points into will as possible, hit me and ran away, so all i could do is remove all spells i had but it still left a faint mark, umm i got a halo, he has super white teeth when he smiles, he has a Daichi on his back (gunna change possibly soon when i find a good enuff weapon to replace it, help on finding one would be appreciated, meaning what types and what augments, etc), and a red dragon in his pocket (same with daichi, might replace but dont know with what). he alternates between monk gloves and killawhite dyed felt-lined carriage gloves. also had Lionhead face/body tattoo. sometimes i take of his hat so you could see his hair, and cuz from some angles the hat and halo look odd. as i said will post pic when i find camera, prolly soon. which one o my guys??? well my 'good' guy that im working on now wears all the Will clothing and i think he still has dreads, or that was my evil/good character.... idk though. I used the webcam on my Computer to get that Picture! Ha! I can't show a pictures of my character but i can tell you that he's fat. He wears wizard hat, pauper shirt, bandit pants, pauper gloves and cuffed overcoat. I'm a female, evil/pure, highway mens clothes on. Using my cunning and knowledge of horrible, and out-of-date fashions...I styled my current heroine as a VERY stereotypical (at least in my opinion) street thug. She has parted hair dyed Kilowhite ( I dunno why) with the gossamer headwrap, her torso is bare (and I likes it that way, hehehe), she wears monk gloves dyed with greypricot, Highwayman trousers dyed with True Blue (for that Urban jeans look) and Explorer Boots dyed Java (because nothing else looked as good). She has no make-up, but has the clockwork tatts (since they looked the most modern). Also to note, she is "The Decadant" with close to 80% Good and 50-60% Corrupt (she looked better with a grin). More to come when I feel like bothering with them. Then the Hot Date outfit. Main color Dark Blue, Trim Aqua. Full good. Bright Will tattoos. I have a female character, wears explorer shirt and boots. Shirt is blood letter red and the boots are black, highwayman coat dyed black and carraige gloves dyed black as well. I also wear the highwayman mask (because it looks badass) and my name is queen (that's right lol). I was 100% evil but just for fun I switched to 100% good. But because I bought the shadow temple I can't get my purity up so I'll probably switch back to evil soon. Very Nice Characters Everyone! Read them all.. Might actually try some out! My male character is 100% Good/Pure. He is bald, no beard or mustache. He has the Lionhead tattoo on the side of his head. He wears an eye-patch, and a highwayman coat with no shirt on underneath (it's an open coat so you can see all the Will lines on his chest/neck). Spire Guard pants and gloves, Explorer boots, everything is dyed white. My female character is 100% Evil/Corrupt. She has a dark red center part haircut, no makeup. She wears a double belted jacket, vintage vest and shirt combo, felt-lined carriage gloves, Explorer pants and boots, everything dyed black. She doesn't use Will, so has no Will lines. Both of them are at 0 fat. The male has max physique, female has no physique. Neither of them have been knocked out, so no scars.